It was quiet for 4 hours. At 22.00 Wednesday evening the snowstorm returned, and it continued all night and all day Thursday. A typical weather report Thursday: -7C, 15m/s wind from 320 true, no horizon, no contrast, visibility 50 m. Snow and strong drifting. The camp has been waiting all day. People went out for 5-10 min and came back in. Otherwise everybody stayed in the kitchen tent, which is nice and warm, thanks to the diesel generator which worked fine. Luckily we managed to repair it yesterday. The cargoline has disappeared under the snow, but it is well-marked. The snow drifts reach chest height, and we can hardly walk in the snow. What do you do on a day like this? We watched movies afternoon and evening, some read, and others profited from the internet connection. Andreas prepaired lunch and Simon dinner. Vi have been in contact with VECO in Kangerlussuaq, St. Nord and Copenhagen through the Iridium phone. We can borrow two drums of gasoline from Nord, which we can pick up once the weather is better. In the evening Simon noted that the generator was completely icy, and covered in snow. If the air intake gets shut off the generator becomes too warm. We hopefully solved the problem. Tonight the wind has changed 35 degrees, and the pressure is going up, maybe conditions improve? This report sounds a bit dramatic, but everybody is fine, we're just bored, waiting. After all we were supposed to drill. Our telex has been on all day, but we have good connections over the Iridium phone and internet. Our VHF is tuned to 8093 kHz, but unfortuntely VECO doesn't go through clearly and we can't hear Summit. When the storm is over we will tune the antenna to 4050 kHz so we can talk to Nord. The snowstorm continues and the crew has sent home small videoclips from camp. There was a snowstorm all night, and when we woke up everything was covered in snow drifts which we couldn't even see, because of the storm. 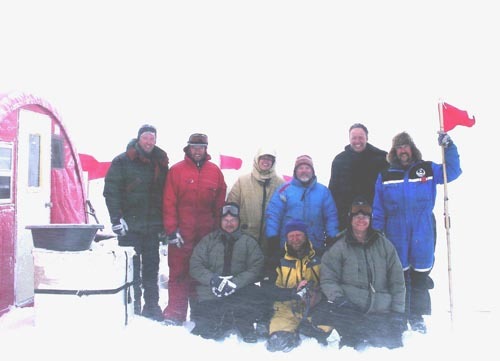 Walking through camp we suddenly sank into knee-high snowdrifts, and the door to the kitchen tent was covered up to the door-knob. Fortunately all cargo had been arranged in long rows, and we could see the top of the boxes. The storm continued until 16.00, and outdoor work was almost impossible. Bruce and Andreas managed to install an alarm around camp, which will make a horn go off in the kitchen tent if a polar bear should walk into it. The horn can be heard all over camp. The kitchen was re-aaranged so we could work on the generators inside the only warm tent. We started with the Hatz generator no. 2, and took apart the motor, until we saw that the cylinder head gasket was not tight. It had simply not been thoroughly enough fastened at the factory. Efter 3 hours of repair we tried to re-start the generator, but it still wouldn't start, this time probably because of dirt in the fuel intake. The motor did not have any fuel filters, which we corrected. We then turned to the Hatz no.1, which had the same problems, and we finished within 1½ hours this time. The Hatz no. 1 went on in the first try, and we are back on diesel again. Two full days using gasoline have reduced our supplies considerably, and we will have to make an inventory tomorrow to see whether this will affect the radar and GPS measurements which involve some skidoo driving. Tonight the weather (and the spirit in camp) improved, and everybody thanked Steffen and Sverrir for their work. A bottle of whiskey came out, and we enjoyed Steffens spaghetti meal. Claude and Dennis worked with the radar until they got tired of the blowing snow. Lars made some GPS measurements without disappearing in the snow. Weather tonight: -5.5C, 5 m/s from 265 true, cloudy with thin clouds and visibility to the horizon. We saw the sun this evening! It's been windy and snowing all night and it continued during the day. In the morning we had 40cm drifting snow between the boxes. Around 15.00 the Twin Otter flew over the camp and we could talk to Jonas over the VHF radio. Jonas could talk to Nord and us, but unfortunately we can't talk directly to Nord on VHF. The snow stopped around noon, for the first time since we arrived. The weather at 15.00: -9.2C, 4 m/s from 295 true, visibility: infinite, overcast with high thin clouds. Vi have finished arranging the cargo-line, with all our cargo line up, so we can find it in the snow. Sverrir and Steffen started on the floor for the drill tent. Meanwhile the Hatz generator no.1 stopped. Probably a problem with the fuel intake ... The problem was found and repaired. At the moment we use the Honda generator. Lunch was Currystew and champignon soup. Bruce brought a bear-alarm fence, and we put it up around the camp. The kitchen is getting organized and cosy. Tomorrow both generators will have a look-over in the kitchen tent. Flade Isblink camp is established now and the irridium telephone is open and placed in the kitchen tent. All in camp are in a good mood. The day has been used to establish camp. The weatherport, the sleeping tents and a "shitter"-tent is up. The generator is running and electrical cables have been pulled to the kitchen tent and the site for the drill/science dome. In the act of preparing the shitter a 1.5 m deep hole has been dug. No melt layers were found. Is the accumulation very high - or has there been no melt last summer? Tomorrow the drill/science tent will be established. It's has been -14 - -10 deg C with wind 8-10 m/s. Ice fog all day. Sunday 14. may, Flade Isblink! The weather was OK and the put-in to Flade Isblink began at 11 am local time. All cargo was moved to the camp in 8 twin Otter missions. Lars and Sverrir drove the skidoos and sledges to the camp using the route north of St. Nord. This route goes over a wide snow covered area which will probably not persist through the June 7th missions, when the next team takes over on Flade Isblink. When we have time we will establish a route south of St. Nord. At 19.00 all flights were completed, and a few hours later ice fog rolled over the camp. The temperature was -11C and there was some windso we hurried to put up the weatherports and tents. After a few hours the most important tents had been erected, and the generator and iridium phone had been installed. We could then call Copenhagen, where people had been eagerly waiting for news. It's been completely overcast all day. Jonas had us on stand-by until noon, but then we cancelled all flights. We thus had the opportunity to participate in a fantastic Saturday evening dinner at Nord. The tables were set with tablecloths and candlelights, and everybody wore ties. After dinner the party continued to the bar that had been transformed to an internet-café by the Kanses people. Our freezer works, and after going down to -25C we pulled the plug. It's ready. Our Hatz diesel generator was tested, and we also tested Nord's barometers against our pressure standard. Friday 12. May, the project has started! After breakfast at 9.00 am we continued finding and sorting cargo. The temporary freezer for ice core storage was erected outside one of St. Nord's garages. It was built within 3 hours, but then the weather was getting marginal, and by the time the Twin Otter arrived from Alert christmas snow was falling. The temperature was -3C and there was almost no wind. We have talkedt to Jonas and Stråle and Rene Forsberg have taken the geodetic equipment out of the plane. Sverrir repaired Naja Mikkelsens skidoo, and the skidoo she borrowed from St. Nord, so she and Yngve are ready to leave. Svend, the head of St. Nord, checked all our papers and reported to the Greenland Command that project Flade Isblink has started. Lars and JP checked the pack-list. If weather permits we will try to get to Flade Isblink tomorrow. Jonas thinks that we can do it in one day. During the week the team has gathered in Kangerlussuaq and the team departed for Thule Air Base at 12:30 local. The US C130 was stuffed with scientific equipment and scientists and we would like to thank the mission commander Jim Grubb from US National Airport for outstanding support. The team was greeted by the DLO (Danish Liason Officer), Tommy Toft in Thule. The air guard and Lars immediately started regrouping the pallets. A pleasant evening was spend in the Club and many old histories where told. Early morning the team started rebuilding pallets. The cargo staged in Thule in March was found behind a door that could not open. This was fixed during the day. Visits at the police for weapon permissions and at the DLO about the summer plans were successful. US C130 used the day for a mission to Alert while our team prepared the pallet for Station Nord. The cargo was ready Tuesday afternoon. We would like to thank the Thule Air Base personal for fantastic support. The 109th came back from Alert Tuesday at 16.00 local time and Jim Grubb could inform that a radar on the C130 had mechanical problems so there would be no mission today, Wednesday. While the 109th returned to Kangerlussuaq for exchange of C130, we used Wednesday sigh seeing. We were so fortunate that we could use a car and had a good day with good weather. In the afternoon the Thule Air Base personal loaded the Flade Isblink cargo in the exchanged C130 with a K60 loader.